Have you ever wanted to achieve something? But achieve it now! Right NOW! And if you don’t achieve it fast enough, do you get desperate? Maybe it's an emergency or maybe it’s just something you just wanted in a whim, but there is a key that may sometimes be difficult to do. When get desperate, the energy around us turns tense and things start to turn out bad. We are energy and we attract the things we give out. Expressing anxiety will only increase our anxiety and will even extend the anxiety to our surroundings. Desperation comes from lack of faith, because we doubt that things will be okay so then we start looking desperately to try and solve the problem. For those of us who believe in God, it helps us to think that God is in control and we know that we don’t need to worry because the things that happen do so for a reason, there is always a purpose and that there is a chance that in the end, we will receive something better than we imagined. When we are in despair, we can do one of several things to get out of it. 1. Pray to God to guide us. - God always wants the glory. The miracles that He does in our lives are such that others will not doubt that the miracle was the work of God. Ask Him to guide you and tell you the steps you need to take and listen carefully to his reply. God speaks to us every day and at all times, you just have to be aware of his messages. 2. The law of attraction - like the law of gravity, the law of attraction does not fail. And it works even when you have no idea what it is. The best way to get what you want is by Visualizing. Visualize what you want very specifically, with great detail. It doesn’t matter if you don’t know how to achieve what you want, what is important is to know what is your goal and live it, feel yourself inside this dream and be GRATEFUL that you have gotten what you want. Believing you have something before having it helps us to manifest what we want in life and it strengthens our faith. 3. And finally BE GRATEFUL. It is one of the most important things to consider in our daily lives. Being grateful for what we have. Grateful for being alive, for having a roof and a bed and clothes and something to eat. Grateful to have people in our lives who love us. Grateful for heaven and earth and flowers and scents. There are so many things for which we can thank every day and we don’t have to wait for Thanksgiving to do it. Don’t worry, Life will give us what we need and what we want right when we are ready to receive it. 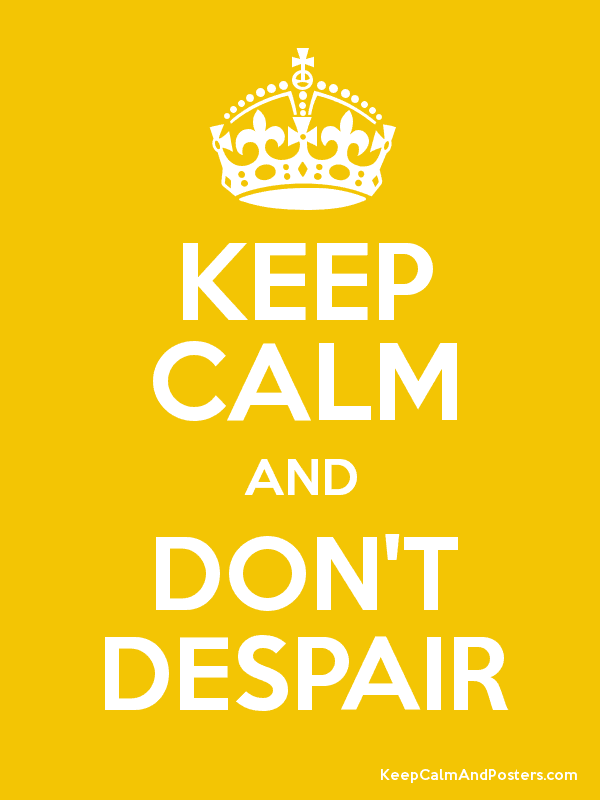 So, do not despair. Alguna vez te has sentido con deseos de lograr algo? Pero lograrlo ¡ya! En este momento. Y si no lo logras rápido suficiente ¿te desesperas? Tal vez sea una necesidad urgente o en otras ocasiones un capricho, pero existe una clave que tal vez en ocasiones sea difícil de hacer. Cuando uno se desespera la energía que nos rodea se pone tensa y las cosas empiezan a salirnos mal. Nosotros somos energía y atraemos lo mismo que expresamos. Si expresamos ansiedad vamos a aumentar esa ansiedad. La desesperación viene de la falta de fe, ya que dudamos que las cosas nos vayan a salir bien y empezamos a buscar desesperadamente como resolver el problema. Para los que creemos en Dios nos ayuda pensar que Dios está al mando y saber que no nos tenemos que preocupar porque las cosas que pasan suceden con un propósito y siempre algo mejor de lo que imaginamos terminará sucediendo. Cuando nos encontremos en estado de desesperación podemos hacer una de varias cosas. 1. Orarle a Dios que nos guie. - Dios siempre quiere tener la Gloria. Los milagros que Él hace en nuestras vidas son tales que otros no dudarán que el milagro fue obra de Dios. Pídele que te guíe y te diga que paso debes tomar y está muy pendiente a su respuesta. Dios nos habla todos los días y en todo momento, solo hay que estar pendiente a sus mensajes. 2. Contar con la ley de atracción - al igual que la ley de gravedad la ley de la atracción no falla. Y funciona aun cuando no tengas ni idea de qué es. La mejor manera de obtener lo que queremos es visualizando. Visualiza lo que deseas bien específicamente. Con lujo de detalles. No importa si no sabes cómo lograr lo que quieres lo importante es que sepas cual quieres que sea la meta y vívela, siente que estas adentro de tu mismo sueño y se AGRADECIDO de que has obtenido lo que deseas. El creer tener algo antes de tenerlo nos ayuda a manifestar lo que deseamos en existencia y estamos reforzando nuestra fe. 3. Y por último SE AGRADECIDO. Es una de las cosas más importantes que debemos considerar en nuestro diario vivir. Ser agradecidos por lo que tenemos. Agradecidos por que estamos vivos, por tener un techo y una cama y ropa y algo de comer. Agradecidos por tener personas en nuestras vidas que nos quieren. Agradecidos por el cielo y la tierra y las flores y los olores. Hay tantas cosas por las cuales podemos agradecer todos los días y no tenemos que esperar al Día de Acción de Gracias para hacerlo. Como vez no hay que desesperarse. La vida nos va a dar lo que necesitamos y lo que deseamos justo cuando estemos preparados para recibirlo. Asi que, no te desesperes.